Starting in the Chamonix Valley, you trek in a clock-wise direction along well-maintained trails to small villages where you will spend the night. The views are outstanding throughout: huge granite spires, tumbling glaciers, snowy peaks and fast-flowing rivers. You will see magnificent Alpine flowers, birds of prey and animals such as ibex, chamois, stoats and marmots. During the trek, you stay at hotels for nine nights and spend one night at an auberge. Geneva Airport is accessible from the USA, Australia, New Zealand, the UK, Canada, and Europe. From there it is just 1 hour to get to the Chamonix Valley by minibus. For our guided Tour du Mont Blanc, transfers are available at an extra cost from the airport to the first hotel in Chamonix. Geneva is well connected by rail to the rest of Europe and the UK. There is a direct train from the UK to Chamonix. The trek begins by crossing to the other side of the valley in 10 minutes and then hiking for 90 minutes on the undulating path that follows the River Arve to Chamonix (1030m). You then continue to Les Praz in 30 minutes. From here you can walk up to the Chalets de Flegere (1900m) in 90 minutes or take the cable car up in seven minutes. At the top of the Flegere cable car you hike through open countryside for 1.5-2 hours to Lac Blanc (2352m). There are incredible views of the whole Mont Blanc range, including Les Grandes Jorasses, Aiguille Vert and Les Drus. You then follow a beautiful path east and descend through the forest to Argentiere. From the French village of Argentiere you hike through old Argentiere and up to the Col des Posettes (1997m) for superb views Mont Blanc and the Chamonix Valley. From here, you traverse to the Col de Balme (2191m) and look directly into Switzerland. You then descend through open country with views of glaciers to Trient (1297m) followed by a short, steep climb to the Col de la Forclaz (1526m). 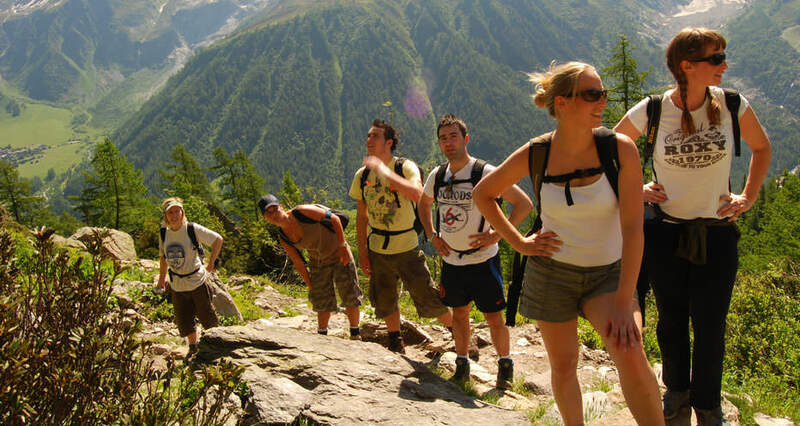 From La Forclaz you hike steadily upwards through the forest along the ‘Bovine Route’ with magnificent views of the mountains of Verbier and the great Sion Valley. At Bovine (1987m) there is a small farm and the route then winds its way down through meadows, forests and open country. Just before Champex there is an auberge where you can sit in a garden amongst the charming forests of Champex d’en haut. You arrive at Champex Lac (1486m) with its beautiful lake-side hotels and cafés. Leaving the lakeside village of Champex it is a gentle 5-6 hour trek to La Fouly (1600m) along the Val Ferret. You walk from the lake and descend to the main valley floor and follow the river through forests and meadows to Praz-de-Fort. You then ascend in similar surroundings with wonderful views of Mt Dolent and the South Face of the Mont Blanc range. La Fouly (1600m) is a pretty Swiss village. You continue from La Fouly and cross into Italy via the impressive Grand Col Ferret (2537). From here, the descent is slightly steeper but rewards you with outstanding views of two of the Alps most iconic mountains – Les Grandes Jorasses and Mont Blanc. You stay at La Palud (1350m), just over 3km from Courmayeur. Today can be used as a rest day or to hike to La Visaille meaning you complete the whole circuit of the TMB on foot. The accommodation at the half-way point between 4 La Palud (Courmayeur) and Les Chapieux is not good enough and so we spend two nights at La Palud. If you choose to walk, you head to Courmayeur (1200m) and then up to the Col Chécrouit (1956m). From here you follow the TMB trail with superb views of the whole of the South Face of Mont Blanc. The mountain is much steeper this side, compared to the views from Chamonix, with fabulous long ridges and gullies – many of which offer the most challenging routes to mountaineers. You descend to La Visaille (1659m) and then take a 15-minute bus ride back to Courmayeur. Hiking time is around 5 hours. Distance: 7 miles (11km) with 3,600 feet (1100m) of ascent and 2100 feet (640m) of descent. You can take a cable car from Courmayeur to gain height and take the edge off the ascent. If you choose to use today as a rest day, Courmayeur is one of Italy’s premier ski resorts and is full of pretty shops, cafés and restaurants. Close by, there is the excellent Skyway cable car, the spa at Pre St Didier and lots of gentler walking options. You could also head to Aosta (one hour by bus) to see Roman walls, an amphitheatre and medieval walls and buildings. From Courmayeur, we take 2 public buses (approx 10 and 20 minutes each) and travel to Val Veny under the spectacular South Face and ridges of Mont Blanc. We trek along a wide glacial valley surrounded by glaciers and high peaks to the Col de la Seigne (2516m) which marks the border between France and Italy. We then descend to Les Chapieux (1549m). Today is quite a long day, although it is not steep. We make a steep ascent above Les Chapieux through marmot country and on through open meadows to more barren scenery. We cross 2 cols (2479m and 2329m) in wild surroundings with fabulous Alpine Flowers and marmots, weasels and chamois. We then head down through open country and on to a narrowing valley to Notre-de-La-Gorge where there is a 15th century chapel. Our destination is Les Contamines (1167m) – a pretty ski village with an interesting church. The hotel is located 1km outside of the centre of Les Contamines. We ascend thought pretty forests and meadows to the Chalets du Truc perched under the great west-face of the Mont Blanc range. There is a small peak we can climb before descending to the Chalets de Miage at 1559m. We then make a steep climb to the Col du Tricot (2120m) and then on towards the plateau above Les Houches. This is a fitting end to our trek with the most outstanding views of the Chamonix Valley, the Chamonix Aiguilles and the Mont Blanc massif. We descend quickly by cable car and take a short ride by public bus to our hotel. Check out from the hotel is normally 11am. If you have booked a transfer to Geneva Airport through us we will let you know the pick-up time the previous evening (day 10). Get in touch today if you want to find out any more details about the Tour du Mont Blanc.